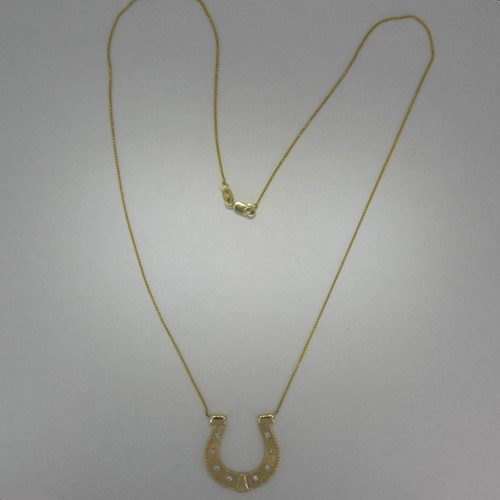 Desc: 14 karat yellow gold and diamond horse shoe necklace. The 14 karat yellow gold chain is a wheat link with a lobster claw clasp. 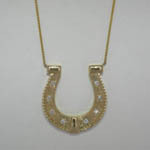 The 14 karat yellow gold horse shoe is textured along the center with a rope design along the outside edging. Diamonds are mounted where holes along the center resemble nail holes of the horse shoe. The eight diamonds are R.B.C. and are SI1-SI2/H-I and are approximately 17 ct.T.W. The horse shoe has a toe guard and heel raisers. The necklace has a bright polish and textured finish. This necklace is made in the United States of America.